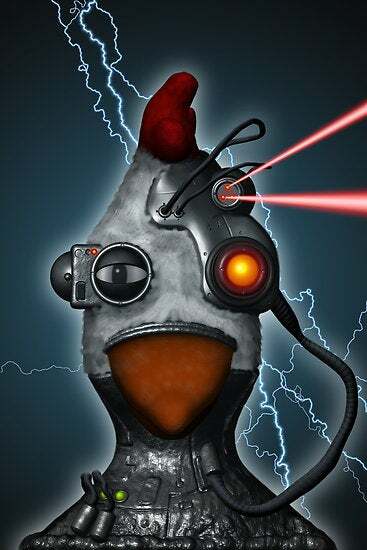 Suppose you keep chickens, and you want to name them according to the Borg designations? So if you've got four chickens, they're one of four, two of four, etc.? So far so good. But then what if one dies and is replaced? That's the dilemma one message board considered. "I have some chickens named with Borg designations. There were originally 4, so each of them was N of 4. Two of them died though, then I got two new ones, so should the new ones get their own group designation ("of 2") or should they become part of the original "of 4"? I would like to be technically correct about this." The flashback(s) in VOY 6x02, Survival Instinct, suggest they will not resize the group unless necessary to accommodate new drones. — Izkata. A side note that I can't think of support for at the moment: I think Borg designations are more akin to routing addresses than anything else. Those wouldn't change when a new node (drone) was added or removed, unless more space was required due to having too many nodes (drones). — Izkata. The new chickens must be named Locutus and Hugh. You can assign these based on perceived personality, letting Hugh be whichever chicken you believe most likely to betray them all and fall for Lore's tricks. — John O. Top image: Faykokowv on Backyard Chickens.